Hot Springs - Lake Angostura Resort - Private Log Cabin! 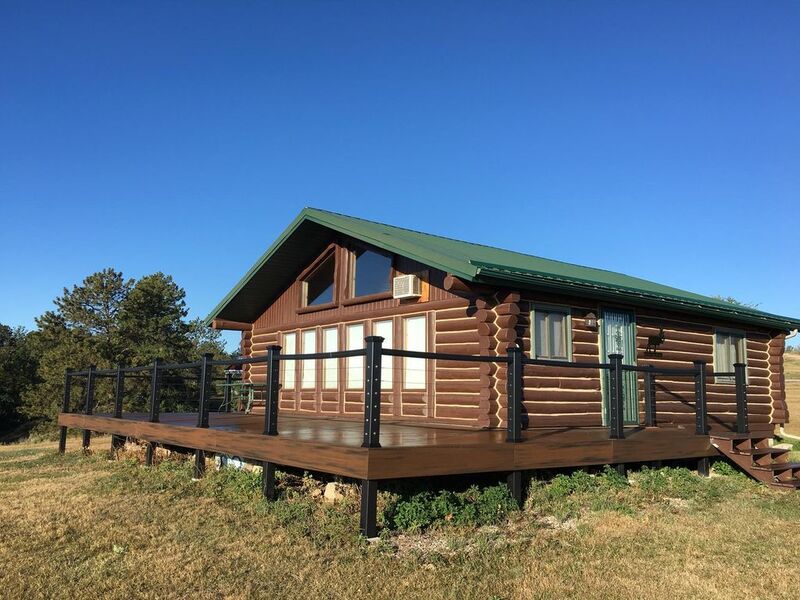 Sneak away to serenity & peace at your very own cozy, private log cabin on 2+ acres tucked away through Sheps Canyon at Waters' Edge at the NW tip of Lake Angostura in the Southern Black Hills, just 15-20 min. from Hot Springs and 1hr 15mins from Rapid City. Beautiful stars and lake views! Just a 10 min. walk to the lake. If it is real action you seek, cross the lake to the recreation side and find a wonderful sandy beach & spirits & other refreshments! One king bed and one queen bed. Completely furnished. Huge deck! Lounge on deck in the dark and share the stars--YOU HAVE NEVER SEEN SUCH ART! Let the peace permeate your soul and spirit! ENJOY LIFE! Visit Evans Plunge Healing Waters, Mammoth Site, Mount Rushmore, Wild Horse Sanctuary, Deadwood, Sturgis, & the Badlands & so much more FUN to choose from! Hello, my name is Linda Gabriel Fuss. I was raised in Redfield, SD and used to travel to the Black Hills for family vacations. I have a small real estate firm in Denver, Colorado. I have now lived in Colorado for 34 years. I travelled to the Hills often, and always when I entered the DANCING WITH WOLVES filming area, just outside of Hot Springs, I would immediately experience a peace and tranquility otherwise unknown to me. I decided that this would be a wonderful place to have a vacation home and share with others the great beauty and benefits of these Hills! I welcome all of you to lay down your daily burdens and chores and surround yourselves with the healing waters, hills and beauty of this area. The people are magnificent! I look forward to spending more time in the Hills, in the meantime, you all enjoy! WE HAVE A LOT OF REPEAT BUSINESS, EVERYONE LOVES THIS PLACE!! IT IS SPOTLESS! I love to relax after our work is done, we usually have chores and upkeep when we visit. I love to sit on the deck and look over the lake; in the evening there is quite a STAR SHOW. Stars as you have never seen them! I enjoy the hiking and the lake. I love the little quaint sandstone village town of Hot Springs. Cascade Falls (natural healing swimming ponds) are a wonderful way to relax, just 15 min drive from the cabin. I relish in the beauty and tranquility and the charm of the authentic log cabin (although modern). Peace is all around them Hills, and works its way into your soul, enjoy the peace my friend, enjoy the peace! LAKE IS FULL, COME ON OVER AND BRING YOUR BOAT. THE BOAT DOCK IS JUST A 10 MINUTE WALK!!! THIS IS INCREDIBLE!! WALK, HIKE, BIKE, RUN AND SWIM!!!! Cozy with amazing views of lake and rolling hills and pines. Open to the kitchen/dining area. Full kitchen with blender, pans, utensils, etc.